Prepare for trouble - and make it duffle! The Pokemon Tattoo Print Faux Leather Crossbody Purse might be just the thing for Team Rocket fans or anybody who enjoys a good Pokemon sparring match. The 7 1/2-inch tall x 10-inch wide bag has a handy shoulder strap atop its faux leather construction. 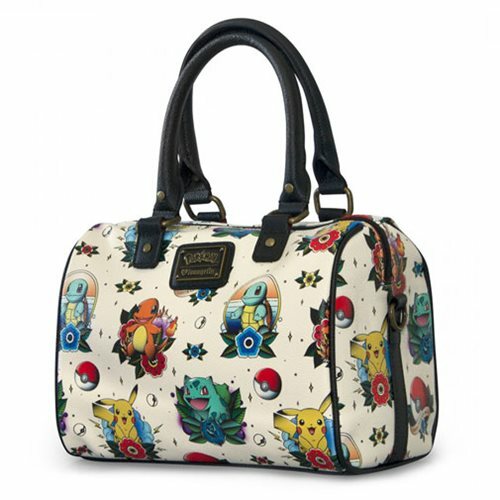 With printed details of Pokeballs, Pikachu, Squirtle, Charmander, and Bulbasaur, this is the perfect thing to carry all of your coolest stuff - your GameBoy, your Nintendo DS, your Nintendo 3DS, and of course a healthy smattering of toys and figures. Ages 13 and up.